While summer temperatures exceeding the 40 degrees Celsius in Athens, my compatriots live between denial and acceptance. Both painful and the heat doesn’t help. For six months the Greek government has been negotiating in the name not of a bankrupt country but in the name of destroyed people. Tsipras’ government tried hard to explain two things, that the debt as it is or the way it has been formed it is impossible to be paid from these people and that the Greek people are dealing with a humanitarian catastrophe that has already claimed over 10,000 dead, over 600,000 hungry and over 1,500,000 unemployed to start with and that til February 2015. Nobody saw it this way. I suppose it is logical; what they care of is money, pay back, profits. Because it has come down to that, like in a crime story, to the profits some (or most depends the way you see it) have made during the Greek crisis and they still doing. And since they hold the keys of the banks and the cash flow, they also have the means to enforce their will as the practice showed last month with the banks’ closures in Greece. Actually they called it - I suppose it has to do with political correctness - capital controls. And new loans came to pay the old loans to a country that could not pay anyway, more interest floating and of course new measures to "help" pay back. But with 70% of the private industry and enterprises destroyed, with nothing moving in the market and no new investments what remains to pay back is the pensions and the salaries. But the salaries, for the ones who still have work and get paid, have gone at least 45% down and pensions are pathetic even to mention. Nobody lives with 350 euros a month especially when medicines and health care have gone up. And here we talk about pensioners who do need medicines, an unfortunate companion with aging that nobody and nothing can change. So where are they going to find the money? They are already taxing the unemployed. How lower the pensions can get? To 200 euros a month? Why then don’t we shoot the pensioners to save us from all the trouble and the money for printing the receipts for their pensions? After a few months without new suicides a new one reached the Greek news last week. So we are already to 10,001 dead. Two major communication companies announced lay-offs so unemployed with rise to the 1,500,200 and what about the hungry? Last year Greece dealt with the phenomenon of kids fainting in classrooms, lacking enough food in their houses. In a month schools are opening again. What are we going to hear this time with more parents out of work and less money in the houses? 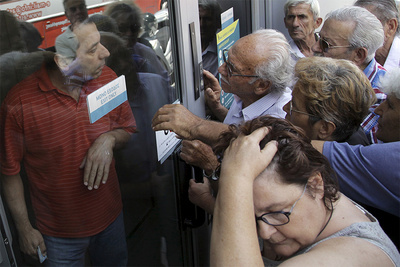 The last five years Greece lived a phenomenon hadn’t lived for over fifty years, since the civil war in the late 1940s. Families leaving their kids in front of churches and orphanages unable to feed them and dress them. There is a 12% of the Greek population unable to offer the basics to their families, including electricity in the house or clean water. They hadn’t had the money to pay the bills for months so they found themselves without electricity and water. Soon they will find themselves without a house or a settler. In February 2015 the number of homeless only in Athens was counting to 10,000; where is this number going to go in the next few months? But troika has returned to Athens to make sure that the Greek government is taking all the necessary measures for the debt to be repaid. You might remember that according to the EU Commission President, a help package is coming to Greece. Jean-Claude Juncker package. Let’s see, the package is for a few millions of euros and the people who can take the money must apply when the announcement comes. They must include all the necessary papers and wait for a couple of months for an approval. Still you might thing that this is good. Well, the help is for new technologies, for young entrepreneurs, for expansion of technology, for ….I’m sorry but this sounds like a bad joke. All these would be perfect in a country where things work, investments happen, a strong funded and founded industry exists and an active market flourishes. If you think that this is Greece then you haven’t read what I wrote before. 70% of the private industry destroyed and the rest 30% either barely survives or has plans for moving somewhere abroad, if they can. Plus the fact that with capital controls you plainly don’t have a market. You have a disaster. Yes this money might give new jobs and new jobs will result less unemployment, less poor, less orphans, less of this and less of that. In due time. This is the magic world. But there is no due time for the 3,000,000 Greeks who live this moment under the level of acceptable even in third world countries, poverty. Period. So the truth is that Mr Juncker’s money are too little - too early - not much use. Greece needs another kind of help now which it seems that nobody can understand and there is a mistake here. This is not about a Grexit or the effects of it for EU, this is not about repayment or bad credit, it is about a disaster that continues and solutions postponed to an unknown future. In maximum two years’ time we are going to find out that nothing has changed, the problem remains with the Greek debt having actually increased another 60% in the meantime and it will be a Greek-crisis all over again. In the meantime how many more will be dead? A nation of homeless? And since we are in the "meantime" of a crisis, there is another tragedy unveiling in Greece these days. In average 350,000 refugees land in the Greek islands every month and perhaps more now during the summertime. Escapees of wars in all Middle East, trying to save their lives and expecting basic help that includes food, medicines and settler. Of course all the European allies and friends emphasizing how tragic it is the problem they refuse to help in any way except - for just humanitarian reasons as they often point - to send army boats to patrol the Aegean Sea and save refugees from sinking boats and then ...transport them to the Greek islands, all for pure humanitarian reasoning. For the rest responsible is …Greece. And Italy of course, since Italy deals with the same problems except the blackmails and the capital controls …at least for now. So Greece is excepted to find solutions with suicides, 3,000,000 Greeks in poverty, 1,500,000 unemployed, 600,000 hungry and at least 10,000 homeless only in the capital, capital controls and repay a debt it is impossible to be repaid and the same time help 350,000 refugees a month without bothering with the details friends and allies. Parenthetically there were British and German tourists in islands like Kos that complained about the refugees and how the sight of them spoiled ...their holidays they had spent so much to anjoy!!! I suppose that is also some kind of western humanitarianism. What the Greek government does? Absolutely nothing. Numb and in denial in front the catastrophic defeat, unable to deal with the problems alone and with an opposition who found the chance for political games. They waste their time in internal fights on what should have been done in absolute denial of what is happening in front of them. We should have said no or yes to the demands from Brussels, and this has become their only problem.Tsipras seems to have surrender to a destiny of a world nobody cares about humans; they only care about numbers. 3,000,000 Greeks in poverty and 10,000 homeless only in Athens are just collateral damage in a world that wants to save Greece but doesn't give a damn about the Greeks. In the meantime another one committed suicide last week. I’m afraid that the only ones gaining from the situation are the Nazis. Pity the Germans never learned from what happened after the Versailles treaty. By the way, back then the Germans had lost a war, what war did the Greeks lost to deserve this punishment? But now the Germans and the rest of the visotrious friends and allies are watching it in Greece happening. And it is happening fast. And denial or acceptance will never be their excuse. What you write, Thanos, is poignant and sad at the same time. It has the pathos of an unfolding Greek drama but it also pathetic in as much as it reveals an inability by those who presently hold the economic reins of the EU to draw any lessons from their past history and avoid its enormous mistakes. What comes through loud and clear from his article and yours and others is that the legal European Commission is now controlled by an illegal Euro-group which is composed of bankers and bureaucrats congenitally anti-democratic and unconcerned with humanitarian values. They have accepted uncritically the social market system adopted by Germany after World War II where one detects rules clearly separated from political democracy; the kind of system one also notices in dictatorial China. It is a kind of savage capitalism unworthy of a Europe’s democratic tradition which actually begins with the ancient Greeks. Within this mind-set, the economy is all and to hell with humanitarian democratic principles and ideals of solidarity. The Germans call it “ordoliberalism” and it is slowly becoming the ideological basis of the whole EU economic policy. This is the stuff that portents future right wing dictatorships, a resurgence of rabid nationalism, war and devastation. One reaps what one saws eventually. The EU founding fathers must be turning in their grave. Meanwhile the likes of you or me or Varoukafis have only our pens at our disposal and also the power of Cassandra prophetically announcing future disasters unless a turn around occurs. There is still time to learn the lessons of the past but alas, time is running out. When I think of all of the billionaires who could gather together right now and Give Greece a Helping Hand to get back on Her feet again, I am Heart-Sick. If no Good Thing is done here, the world will come to rue This Day - Another Day of Infamy !